Small model sheet of SNOW, character of Zombie 15'. This is for a piece of board game. i really like the designs for this character. t'es le meilleur bib ! le meilleur ! 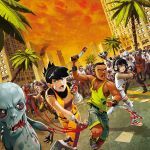 Hmmm... French artist... Game envisioning of a zombie apocalypse... For some reason, I imagine the city dwelling characters will possess free running skills to ensure that they can defiantly survive the perilous ravenous zombie hordes they'll find themselves besieged by. I'm not complaining, just anticipating. You're welcome, well I like it. Good enough example for a class project/assignment I have. ca me rappelle vaguement quelque chose ! bravo pour tout le taff effectué. OHHHH oui moi aussi, tu m'étonnes. J'en parlé sur la page facebook hier!!! Merci Xavier en tout cas !!! !